13 cameras are fixed on Metal's most diverse band of the decade as The Metal God delivers one of his best live performances in front of 200,000+ Brazilians. The set consists of Halford, Fight and Judas Priest classics 'Stained Class,' 'Electric Eye,' 'Metal Gods' and 'Breaking The Law'. All hail Halford, the Metal God! Wow, wow, wow! Watching this dvd just puzzles me why Rob went back to Priest, I guess more or less for the paycheck...but oh well, this release is just pure magic. First off the Resurrection cd is included in this set, freshly remastered and newly expanded with 2 tracks from the Resurrection sessions (Sad Wings and Hells Last Survivor), both of them previously appeared on the Japan release and later as (uh-hum) live versions on Insurrection. They make a nice addition finally on the US side. There are 2 brand spanking new tracks Fetish and God Bringer of Death. While they are powerful and fast, and have that trademark Halford scream, they appear out of place on the cd, because again, they are newly recorded, so the mix and sound is different from the rest of the tracks. No bother though, they don't take away any of the majestic from Resurrection. Now the DVD is a real treat. Halford and his band just slay for 14 songs, and 60 minutes, and you get it all. Halford classics, Fight classics, Priest gems (Jawbreaker and Stained Class) and classic (Breaking the what?...Let's break that Law! and Electric Eye). The DVD is incredible and while it was heavily bootlegged for years, this is the official, cleaned up (video and sound) version, worth every penny. This is a great little DVD from the Halford band. 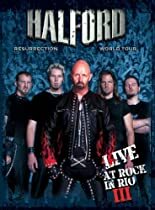 It's basically a 90 minute feature that intersperses Halford's live set from Rock in Rio, with Resurrection studio footage and interviews with the band that look back at that time period. The live footage from Rock in Rio III is very good. The Halford band is very tight, and can burn through their own songs as well as the Priest classics. I know we should all be happy that Rob can still belt out the classics, but I do wish he would move a little more on stage. I don't know if he's reading off of a teleprompter or just concentrating on the delivery, but he is fairly motionless on stage. But the live show is only half of the DVD. What I especially enjoyed was watching Rob in the studio, delivering and editing lyrics during the Resurrection studio sessions. I always love watching how an album gets made, and watching him completely overhaul the lyrics to what would eventually become 'Drive' is very interesting. To me, the studio sessions are the best part of the DVD. All in all, a good DVD. Also, for those interested, it's 4:3 aspect ratio and 5.1 Dolby Digital. HALFORD LIVE AT ROCK IN RIO 3 IS AMAZING. SOUND, PERFORMANCE AND ACCESS TO THE METAL GOD ARE ALL HERE -- FINALLY!!!!! A MUST BUY FOR ALL METAL FANS.